Goldendoodles are one of the dog-world’s ‘newer’ mixed breeds. They’re a cross between a Poodle and a Golden Retriever, and were bred with the intention of creating a larger Poodle cross-breed that possessed the friendly, sociable nature of the Golden Retriever. They also tend to be fairly high-energy, which can make feeding them a bit of a choice. Lucky for you, we put together a guide to help you navigate your Goldendoodle’s nutrition needs. Check it out. **Below, you'll find our expert's science-backed advice, but you can also click the links above to see current prices or read customer reviews on Chewy. Figuring out how much to feed your Goldendoodle will depend mostly on how large it is. Goldendoodles will end up being one of three different sizes once they reach adulthood. Miniatures tend to weigh between 15 and 35 pounds, small standards weigh somewhere between 40 and 50 pounds, and large standards will weigh in at 50 to 90 pounds. Goldendoodles tend to vary quite a bit in size because most of them are first generation crossbreeds. This means that Groodle puppies usually have parents that are a Golden Retriever and a Poodle—not two Goldendoodles. Here are the basic caloric requirements of Goldendoodles in all three of these size categories, based on how active your dog tends to be. For more information on this and related topics about Goldendoodles in-general, take a look at this article about the breed on petguide.com. Youtube.com can be a great resource for information on virtually any subject—including dog care, nutrition, and training! Here’s one video in-particular that I really liked concerning this breed. It includes some basic information about Groodles, and talks briefly about what it takes to care for them. Thankfully, Goldendoodles tend to live longer and healthier lives than either of the breeds in their parent-line—mostly due to the fact that they’re a hybrid. With that being said, there are still a few health concerns that owners should be aware of. Here are some of the most common ones. This is a disease that affects the retina of the eye. It generally starts out by rendering the dog night-blind, but may end up causing them to lose their sight during the day as well. Antioxidant nutritional supplementation can help to slow the progression of this disease, though there is technically no ‘cure’ for it. This website has published a very thorough article on the subject that can give you a lot more information on this disease in-particular. This condition can affect both humans and dogs. Dogs that suffer from this disorder (which inhibits the blood-clotting process) often end up with symptoms like nosebleeds, prolonged bleeding from wounds, bleeding gums, and bloody stools. It can’t be cured, but it can be managed with treatments. Petmd.com published a pretty good article about this disease, which you can find here. This condition, also known as ‘slipped stifles’ or ‘trick knees’, is a problem that many small breeds have to deal with. It basically happens when the knee joint slides out of place, which can cause a lot of pain for the dog. It usually occurs in the hind-legs, and can be debilitating if not dealt with. A diet rich in omega-3 fatty acids, Chondroitin, and Glucosamine can sometimes help—as can keeping your dog within healthy weight limits. You should also keep an eye out for these health conditions as you raise your Goldendoodle. Not all of them are common, but spotting them early is the key to getting your dog the treatment that he/she needs. Gastric Dilation-Volvulus (also called bloat) can be a life-threatening condition for Goldendoodles. This condition occurs when the stomach gets distended with gas, and then twists—leaving the canine unable to get rid of the trapped air. To avoid it, try to feed your dog in several smaller meals over the course of the day, rather than in one or two larger portions. Goldendoodle puppies are very social creatures—which is why it’s important that they spend enough time with their mother and the rest of the litter before being separated to join a human family. Living in this environment teaches them how to interact with other dogs, and is vital to their growth and development—which is why most specialists agree that all pups of this breed should stay with their mother and litter for at least 7 weeks before being relocated. This is when weaning takes place. It’s also close to the beginning of the Goldendoodle’s prime human socialization period, which takes place between weeks 7-12. It’s very important that the pup be exposed to humans and a variety of human experiences around this age, as this activity will form the basis for how they learn to behave and act around people. At 8 weeks of age, the average Goldendoodle will weigh somewhere close to 6 pounds. A puppy of this size will need to eat about 280 calories per day to stay healthy, or maybe more if they tend to get a lot of exercise. Goldendoodles should eat puppy food until they’re about 12 months old. After this, they’re usually ready to transition to adult dog food. We recommend Nature's Variety Grain Free Dry Dog Food. This breed needs a complete and diverse range of nutrients in their diet to remain healthy. Since Goldendoodles can tend to be a bit on the smaller side, it’s important that they get the vitamins and minerals that they need to support healthy bone and joint health, as small dogs can sometimes have issues with conditions that have to do with these parts of the body. At the same time, this breed also tends to have a larger-sized middle-body, courtesy of their Golden Retriever lineage—which means that they can be susceptible to bloat if you’re not careful. To help deal with this, you’re going to want to feed your dog a food that’s high in real nutritional value to promote digestive health. After doing our research and looking at the best Goldendoodle dog foods on the market today, we’ve come up with our top pick for the best Goldendoodle dog food—Nature’s Variety Instinct Grain Free Dry Dog Food. It’s grain free, gluten free, and was thoughtfully designed to balance wholesome and natural foods for maximum nutritional value. It contains red meat, poultry, heathy vegetables, fruits, and is easily digestible—which is good for a Goldendoodle’s bones, joints, and stomach. Here are the basic pros and cons that we’ve discovered about Nature’s Variety Instinct over the course of our research. Contains tomato pomace, which can be considered "filler"
There are definitely a lot of high-quality dog foods on the market today—but in our opinion (and after doing our research), we can’t help but to recommend Nature’s Variety Instinct Grain Free Dry Dog Food as our number-one choice for Goldendoodles! We give this option two-paws up, and highly recommend it. 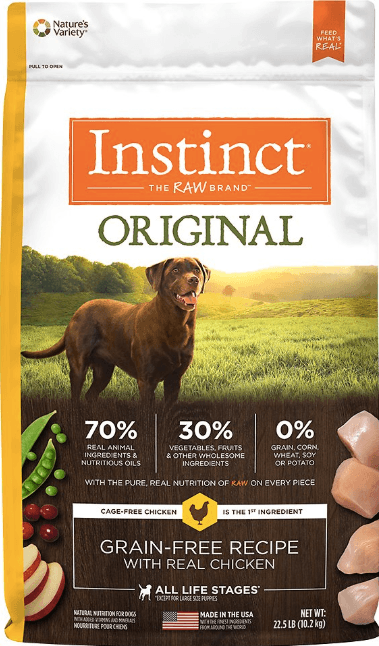 Filled with wholesome ingredients, and specially formulated to give your dog the nutrients he/she needs for a long, healthy, happy life, we simply feel that you can’t go wrong with this one. I want to make my own food for my golden doddle 10 week old pup. I plan to give him chicken or beef or turkey and fish with veggies and cottage cheese. I made his mothers food and treats. I also plan to give him fruits that he can have. What do you think?? ?